Ever since the Tax Working Group (TWG) released their final report last February, New Zealand’s political discourse has been largely dominated by its recommendations – most notably, the introduction of a capital gains tax (CGT). Plans to introduce a CGT has induced strong reactions from both sides of the spectrum: from being called an “attack on the Kiwi way of life” by the National Party, to being celebrated by Labour and the Greens. The one party that have kept mum so far is the third Coalition partner, New Zealand First. 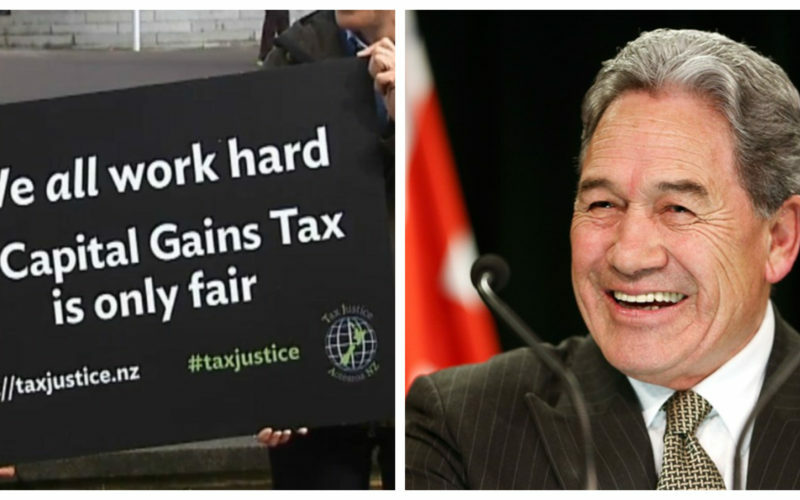 While historically being opposed to it, NZ First’s only recent comment on the TWG’s recommendations is from leader Winston Peters who said: “tax policy needs to be simple and we will keep it that way”. That nebulous statement from last month has been made clear today, as his party successfully repelled a complicated new tax. Prime Minister Jacinda Ardern announced today that the Coalition would not implement a CGT, as the different parties “have not been able to reach a consensus”. Given that both her party and the Greens have campaigned repeatedly on imposing such tax, it is obvious it was NZ First which extinguished any hopes of a CGT happening. It should also be noted that there was widespread public opposition against this new tax being introduced, especially one as ambiguous and confused as the TWG’s proposal. But what exactly did the Sir Michael Cullen-helmed TWG suggest for a CGT? 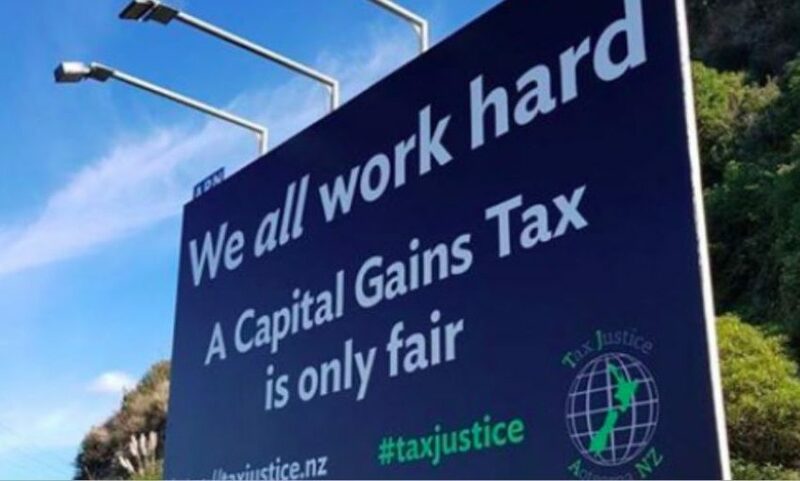 Lobby group Tax Justice Aotearoa has campaigned for a capital gains tax to be introduced. Simply put, a CGT is a tax on the profit from the sale of an asset. The TWG’s proposed CGT would include residential property, businesses, all land and buildings, and shares but will exclude the family home, collectibles such as paintings and jewelry, cars, and household appliances. Introducing a CGT has been floated consistently over the years by both the Labour and Green parties, with the common argument that it will bring “fairness” to our tax system. The rationale being that an individual who works 40-hour weeks has to pay tax on their income, but a property speculator who buys a house, and then resells it for a profit, pays no tax on that income. Both Labour and the Greens have argued that the current tax regime was unfair, and that a CGT can “fix” this imbalance, but neither can properly explain the specifics of their respective CGT policies in the past, however. Former Labour leader David Cunliffe was infamously caught unaware of his party’s own CGT policy by former Prime Minister John Key during a televised debate leading up to the 2014 elections – a moment which cemented National’s victory that year. The former’s failure to delve into details was not due to lack of knowledge, Cunliffe was widely held as one of Labour’s intellectuals, rather it was because the issue of a CGT is complicated to begin with. The family home for example is exempted from the CGT, but not business offices. What if an individual ran a business from their family home, would a CGT be applied if the property was sold? What if a family owned a farm – which under the TWG’s proposal is subject to a CGT – but also had their family home inside the farm, would it qualify for an exemption, or be taxed as a land asset? And if Labour and the Greens want to talk about “fairness”, why is the CGT going to exclude luxury assets such as paintings and yachts? These items can easily be used by the wealthy to earn a tax-free income. Meanwhile, a small business owner who wants to sell-up to fund their retirement will be hit with a CGT – despite having no intention to earn an “unfair” income from their asset sale. The proposal of a CGT by the TWG would simply complicate our tax system a lot, while at the same time failing to adequately address the issue of “fairness” also. This is perhaps the reason why NZ First rejected its implementation – it seemingly creates more problems than solutions. This is not to say that the tax system is not without flaws. An important issue the CGT was supposed to address is the rampant speculation of residential properties, which is blamed for locking out many Kiwi families from owning a home. In 2015, the previous National-led government introduced the “Bright-line test” which would tax capital gains on assets bought and sold within two years. If an individual bought a house, and sold it again in a short period of time, you can suspect that they never intended to make that their “family home” and was merely after the profit to be made. When the Labour-NZ First Coalition took office, they moved to extend the bright-line test to five years rather than just two. Property speculators could have waited out the previous two-year period and still resold their asset for a profit, but with a five-year gap they may be less patient to do so. With the bright-line test, there are very little exemptions made which makes it less complicated than a capital gains tax. The “main home” is one such exclusion, which is similar to the CGT, and is defined as the house you primarily live in. This is a much more straightforward approach than the CGT, and with a simple tweaking by the incumbent Government – that is extending the number of years it applies for – it can better crack-down on those who are simply exploiting the system to earn a tax-free income. What is of note is that the bright-line test does not include businesses or farmlands, but much like the modification applied by the Coalition Government, it would be easier to make revisions of this existing policy instead of introducing a meaty, CGT policy altogether. The simplicity of that move would be in-line with NZ First’s standard of maintaining a simple tax code, and will also have a more conducive response from the general public – especially given that most of the opposition against the CGT was down to the proposal’s ambiguity. I get it that the CGT proposal has given us all a bit of excitement. But does any ordinary reasonable person actually think it’s going to go ahead in this form?? The kiwi way of life is that every 9 to 12 year cycle Winston & NZFirst have a veto on dumb ideas. Like this one. Published last February, Ross’ tweet proved prophetic as it seemingly predicted how NZ First reacted. 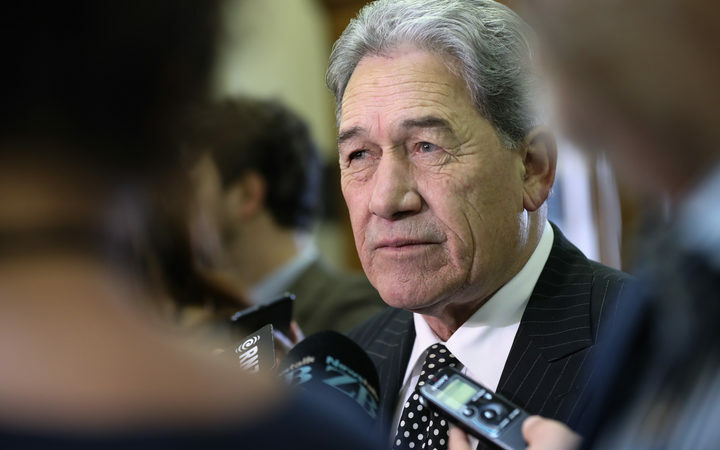 It has appeared that Peters and his Party have vetoed a very flawed policy by their Coalition partners, and that decision could reward them at next year’s election.